So, at last we are off! Matt lives at the beginning of the day and normally rises about 5:30am. I don’t! So his repeated insistence that we should get an early start does not fill me with enthusiasm. But I can see the wisdom of what he says. An early start allows us to evade the worst of peak hour traffic and so, having set my alarm for 5:30am, I woke repeatedly through the night expecting the alarm to go off any minute! Eventually the alarm DID go off and, of course, I was sound asleep then. Matt, predictably, had already been up and about for half an hour. Sometimes I think we will never see this matter eye-to-eye. So I dragged myself out of bed and slowly achieved a semblance of an awake state. We had already agreed that we would not have breakfast until the “normal” time, ie., about 8:00am. 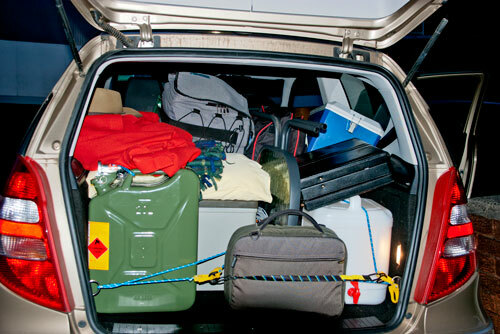 So we set about the task of loading the car. What a task! I have to be honest and say there were one or two items that we decided not to take, simply to save room. The back seat of the car was lowered and then the boot and the lowered back seat were packed — not quite to the rafters, but fairly high. Somehow we got it all in (less the discrarded items) and it all seemed fairly secure. Matt’s being a morning person, we agreed months ago that he would drive in the mornings and I (being a night person) would drive in the afternoons. So here is Matt, all geared up and ready to go! At 6:40am, we pulled out onto the street and drive off for the beginning of our adventure. Just 9,000 km (6,000 miles) to go! We wove our way through the suburbs and onto the Sydney-Newcastle Expressway. Eight o’clock turned out to be a good plan as we arrived at a freeway service area (motorway service area) just on 8:00am. It must have been a good idea because lots of other people seemed to have the same idea. 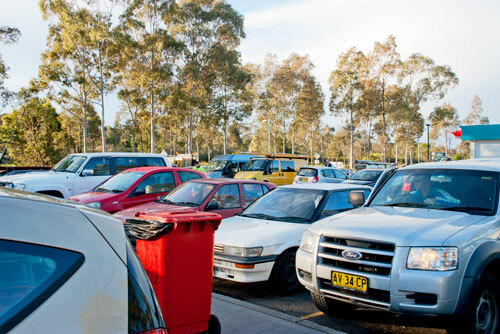 The car park was almost full! There are two or three different eating establishments in this service area and they all seemed to be crowded. Bacon, eggs, orange juice and (for me but not for Matt) a coffee, made an adequate breakfast. We allowed ourselves a bought breakfast on this first day because of the early start. From here on we will prepare our own breakfasts and have packed the ingredients we need for that. After brekky it was back onto the freeway (motorway) and up to the Hunter Valley. Then onto the New England Highway and further up the Hunter Valley to Muswellbrook. 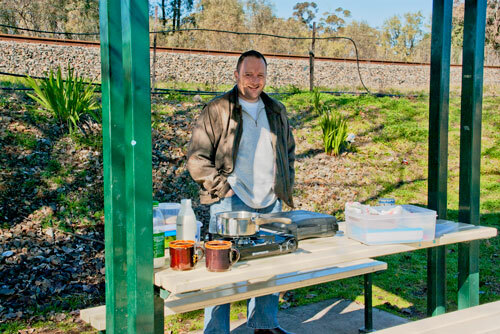 At Muswellbrook we stopped in a picnic area on the northern exit of the town for morning tea about 10:30am. 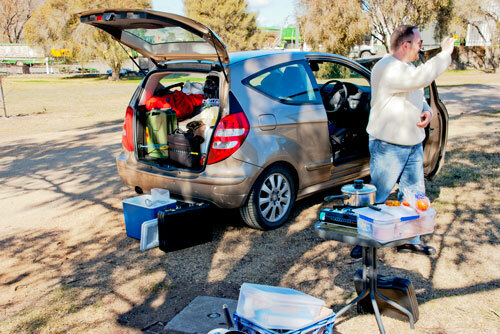 Matt had his first chance to try out his little gas cooker in the field. He discovered (of course) that breezes in the open air mess with the flame and it took longer than he expected to bring water to the boil. But boil it did and a steaming mug of coffee was enjoyed by each of us. This picnic area features a quite impressive monument to the service personnel who lost their lives in the Vietnam War (sorry, no picture) and if you are going through Muswellbrook some time, I suggest you stop and have a look, being sure to read the detailed explanation that is given, pointing out that each feature of the monument has a particular significance. And so on up the New England Highway to Willow Tree (a tiny hamlet that marks the point where the Kamilaroi Highway, running north-west, breaks away from the New England Highway, which continues in a northerly direction to Tamworth, Armidale and Tenterfield). We took the Kamilaroi Highway and headed north-west. Our stop for lunch about 12:45pm was at Quirindi. 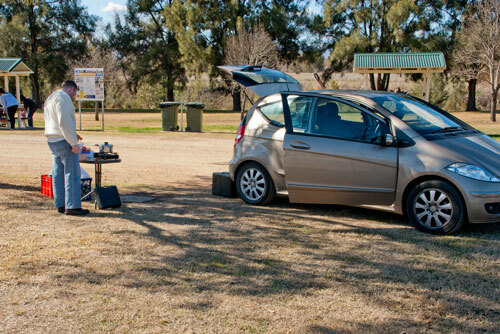 We pulled into a surprisingly well-kept and clean picnic area called Rose Lee Park (no, Rose, not Rosalie Park!) Lunch was ham, cheese, tomato and avocado sandwiches, made on the spot, followed by coffee for me and tea for Matt. Here is Matt using his iPhone to take a short video (he plans to post some of them online and, if and when he does, I will either embed them in this blog or provide links to them). He has done this at the oddest of times and I have no idea how it will all turn out. And so back into the car and, now with me driving, it was on towards our goal for the day, Moree. As we were coming out of one town (I think it was Boggabri) we were overtaken by an ambulance with lights flashing and siren wailing. It screemed up the highway and left us far behind. Then, a few kilometres short of Narrabri, we came across a bad road smash with a couple of ambulances and several police vehicles, plus lots of other vehicles that had stopped to look/help. We did not stop (they didn’t need any more spectators) but it appeared that a large road transporter had run over a small sedan, squashing it badly. We listened to the radio news bulletins but heard no reference to it. We hope people were not too badly injured. But it did not look good. A sobering reminder of the need to be careful drivers. Around 3:30pm or so, we stopped on the side of the road, still about an hour short of our objective. It might have been an afternoon tea break but neither of us felt like another coffee at that time. So we just had a break with a bit of a look around. 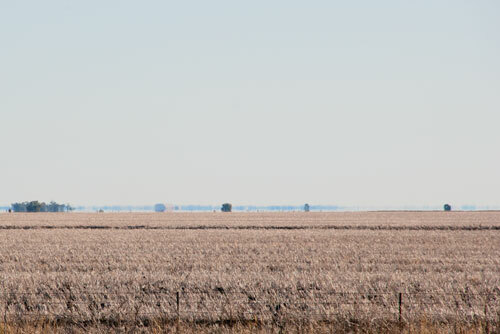 On one side of the highway we could see for miles across the Gwyder plains. There is even a mirage, even though this is July and mid-winter. 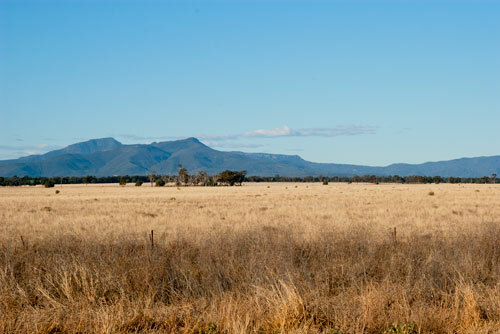 On the other side of the road we could see the magnificent New England Ranges. It was a very clear day with absolutely no haze (as is often the case on a fine winter day) and one almost felt as if the mountains could be touched. And so to Moree, arriving about 4:45pm. 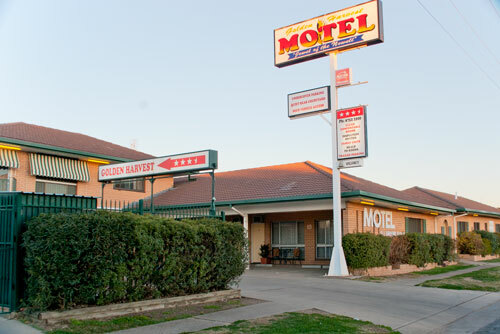 The Golden Harvest Motel is clean and comfortable with a very reasonable tariff of just $65 a night. We are not going to find a cheaper motel on this trip. The only disadvantage so far is that it has no restaurant. But we were able to walk to another nearby motel which has quite a good restaurant serving both Chinese and Occidental meals. We each had a fillet minion and felt (with a glass of red) it was a fitting conclusion to a long but satisfying first day’s travel. Tomorrow is another day of around 630 km (a little under 400 miles) as we cross the State border and enter Queensland. Our destination tomorrow is Charleville (pronounced Charlie-ville) and I will try to tell you more about it when we get there.